The UN General Assembly has declared 2019 as the International Year of the Periodic Table of Chemical Elements – this year marks the 150th anniversary of its discovery by the great Russian scientist Dmitri Mendeleev. In Russia, the opening ceremony of the International Year is held today, February 6, at the Presidium of the Russian Academy of Sciences in Moscow. The opening is timed to the Day of Russian Science and the 185th anniversary of the birth of Dmitri Mendeleev. The Russian Academy of Sciences, the Mendeleev Russian Chemical Society, the Ministry of Science and Higher Education of the Russian Federation, Russian and foreign scientists initiated the Year of the Periodic Table. The initiative of Russia was supported by foreign countries, international scientific organizations, as well as by over 80 national academies of sciences and scientific societies. The Year of the Periodic Table of Chemical Elements will be running under the auspices of UNESCO in some countries of the world. In the framework of this event, it is planned to hold many activities: scientific conferences, thematic exhibitions, contests for young scientists, etc. 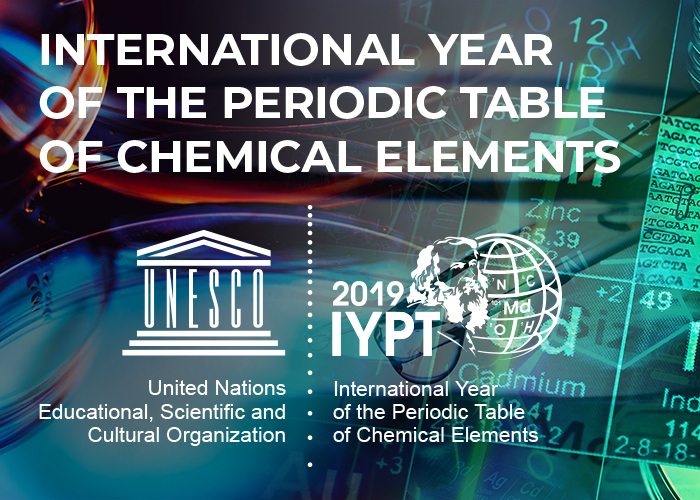 More information on the annual action plan can be found at the website of the International Year of the Periodic Table of Chemical Elements. Here you can register your chemical activities. 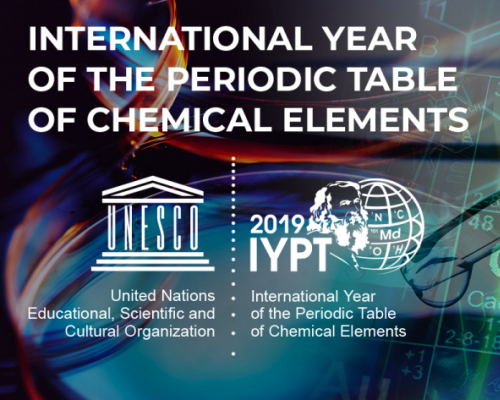 A solemn opening ceremony of the International Year of the Periodic Table of Chemical Elements was held on 29 January 2019 at the UNESCO Headquarters, in Paris, France. Young scientists from Tomsk Polytechnic University PhD student Irina Mironova and master student Daria Votkina took part in the ceremony. In Russia, the opening will take place today, on the eve of February 8, the Day of Russian Science and Dmitri Mendeleev’s birthday. According to the Director of the TPU Research School of Chemistry & Applied Biomedical Studies Mekhman Yusubov, the declaration of 2019 as the International Year of the Periodic Table of Chemical Elements is certainly a landmark for chemists both in Russia and the world. ‘Dmitri Mendeleev played a significant role in the development of chemistry for the entire world. It is gratifying that Russia actively participates in running the events of the International Year of the Periodic Table of Chemical Elements. Chemistry should be always positioned as one of the most important sciences. The memory of the great scientist, the first Honorary Member of Tomsk Technological Institute (TTI) is carefully preserved at Tomsk Polytechnic University. Being a major figure in the field of education, Dmitri Mendeleev showed particular interest in establishing a network of polytechnic (technological) institutes in Russia and the development of science there. Dmitri Mendeleev actively participated in the development of Tomsk Technological Institute – he was a member of the committees developing the construction design of TTI, helped to equip laboratories and rooms of the Institute with advanced equipment, hired qualified scientific staff. He was offered to be the first director of Tomsk Technological Institute. For health reasons, Dmitri Mendeleev had to refuse, though he suggested the candidacy of his disciple Efim Zubashev who headed TTI from 1899 to 1907. On 22 January 1904, in gratitude for the invaluable assistance, the TTI Scientific Council elected Dmitri Mendeleev the first Honorary Member of the institute. 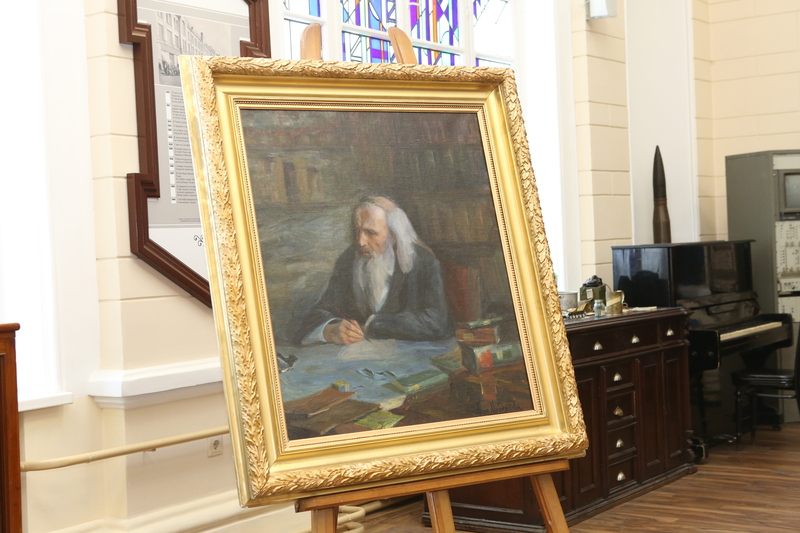 TTI Director Efim Zubashev addressed Mendeleev’s spouse Anna to paint a portrait of the great scientist for the institute. Now the picture is kept at the Museum of Tomsk Polytechnic University. The work is one of the last painted from life portraits of Dmitri Mendeleev.